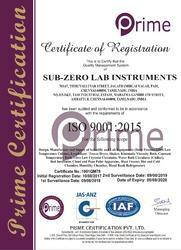 Sub Zero Lab Instruments established in 1996 is one of the leading manufacturers and exporters of Scientific and Laboratory equipments in India. An ISO 9001:2015 certified company; we are one of the pioneers in this field serving customers across domains in research labs, quality control labs, petroleum Quality assurance labs, leading pharmaceutical laboratories and all institutional laboratories. Our precision and engineering excellence help us to be the preferred supplier in most of the prominent labs across India. Our excellence is crafted with the support of the best class infrastructure, modern machineries and a dedicated manufacturing team. A dedicated R&D and service engineer team is in constant interaction with the customers for both service backup as well as to meet the improvements required by them from time to time. Sub Zero true to its name meets the delivery, quality and service requirement of the customer with utmost precision and perfection. We differentiate ourselves in the marketplace by constantly upgrading our products in line with customer expectations through continual improvements. As environment friendly company we ensure that the effluent and emission norms are met as per global standards. Systems for proper usage, recovery and disposal of refrigerants are well maintained in the company. The aim of our company is to be among the top ten admired companies in the field in the years to come. The strenuous efforts of our team members are underpinned at our modernized work set up that is judiciously upgraded to harmonize our proficiency with the increased industrial challenges of precision engineering. We have invested substantial amount in implementing leading techniques at our infrastructure which consists high speed manufacturing unit, highly advanced quality testing laboratories and hyper connected distribution modules. Our modern day instruments are designed to attain higher level of precision and unmatched performance standards. And, to assure our clients with the caliber of our instruments, we strive to exhibit our strict quality compliance. From the stage of procuring raw materials to the stage of product development, our expert quality control associates verify the business operations to assure our adherence to the highest industrial standards. Our company has acquired huge clientele support by providing desirable and quality tested range at industry leading prices. Through conducting regular market surveys, we under the accurate demands of clients and strive to provide solutions accordingly. It is due to our ability of providing reliable and desired solutions that we have expanded our client base almost all over the nation. Our product offerings stand for utmost precision and perfection. This is why, we spare no effort to leverage the expertise of our established workforce. Besides, our diligent people are backed with sophisticated manufacturing technology and thoughtfully developed business models to sustain the ethical policies and transparent dealings. In addition, our mission to deliver best quality products at the best price earned us the capability to become the preferred manufacturer in the world. We have recruited technology experts who are passionate to sustain the leading stature of our organization. We strive to be at the fore of the industry and owing to the keen attitude of our team members we have become the leading manufacturers featuring innovation and precision at the utmost. Further, our team of highly experienced R&D specialists, manufacturing engineers, warehouse managers, quality controllers and distributing personnel are laying emphasis on collegial work culture to attain the desired end results. Our manufacturing brand is Sub-Zero.